Most combination padlocks are extremely vulnerable to surreptitious attack. Many can be shimmed open using a coke can (or similar) and most common branded ones can also be easily decoded using simple online guides. Many standard combination padlocks give away the third number making even the worst case of brute forcing a two number combination fairly easy. 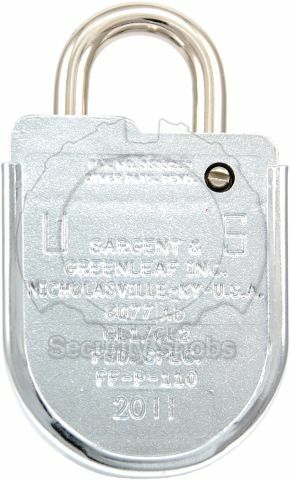 The S&G 8077 Combination Padlock is one of the only secure combination padlocks we have been able to find. It is primarily used by the government and government contractors due to its high security nature. The combination lock operates virtually identically to a standard safe combination lock and uses similar security and inner workings. The shackle is not extremely thick on the lock meaning it is able to fit many applications but with large enough bolt cutters it can be cut. The primary goal of the 8077 combination padlock is to ensure that if someone gets through the lock you know it. This lock uses a 3 number combination followed by a return to zero. It opens using a left-right-left-right pattern. To open the lock, turn counterclockwise and stop at the first digit of your combination on the 4th time passing it. Turn clockwise and stop on your second number when passing it the 3rd time. Turn counterclockwise again and stop at your third number on your 2nd time passing it. Finally, turn clockwise and stop at zero. Pull the shackle to open the lock. (Virtually all three number combination lock that does not require returning to zero after the combination is dialed is really only as secure as a two number combination. Once the first two digits are dialed, the last number can be determined by trying every number until one opens the lock. Returning to zero requires the third digit be entered precisely for the lock to open.). For full details on combination changing and use please see the S&G 8077 Combination Padlock instructions. 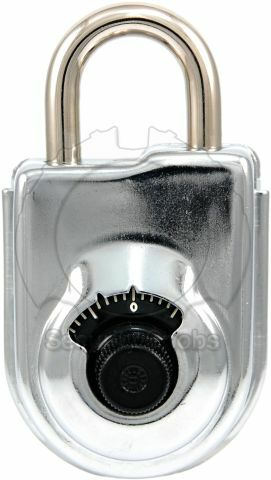 We sell this lock in both new and used varieties. New the lock cost several hundred dollars and used it cost under $100. 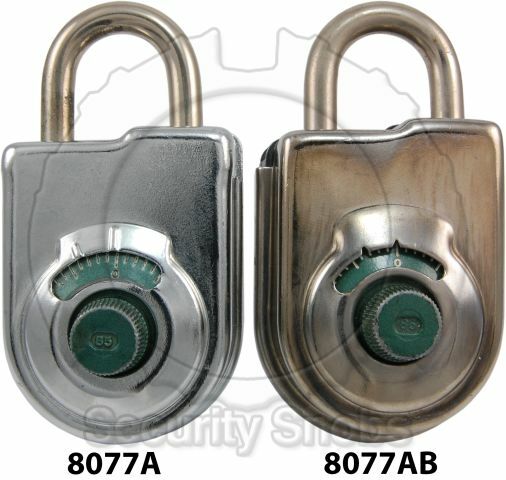 The new version is the 8077AD lock with the used variety being either the 8077A or 8077AB editions. The largest visible difference is the spy cover / dial indicator on them (see pictures). Overall they function in the same manor. 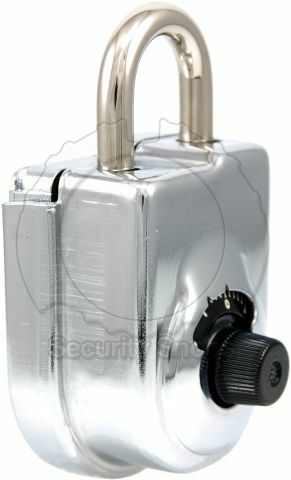 The lock is a high security lock and the combination can be changed using the 8077 change key. This change key is not unique to one version of the lock and will work on all the 8077 combination padlocks. If you buy a change key from us it comes with full instructions on how to change the combination. Used locks come programmed with an initial combination that will be included on a card with the lock. New locks come set to the factory default 25-0 and a change key is included (at no cost) for changing the combination. 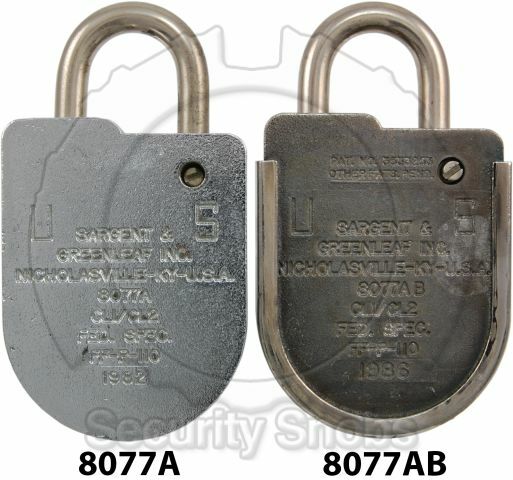 Sargent & Greenleaf 8077 High Security Combination Padlock was successfuly added to your shopping cart. You can browse for more products or proceed to checkout.